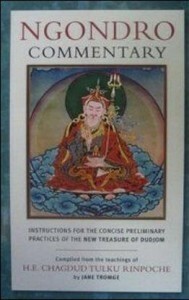 The Buddhist Ngöndro Practice is a condensed form of the entire Dharma expounded by the Buddha, including the teachings of Guru Padmasambhava and many other lineage masters. Nothing has been left out. The ngöndro encompasses all of the essentials which lead to enlightenment and the actualization of this practice is of great benefit for everyone. It is a skillful method, an easy way to apply the views clarified by philosophical inquiries into mind and life, so that these understandings can transform our activities. As we practice, our interest and devotion quite naturally awaken, encouraging us to deeper commitment.